The blue lagoon or Golwern Quarry (Goleuwern) is well known by locals in these parts but not so much by the many visitors who pass by the pretty towns and roads of Mid Wales without even realising it exists. Wild swimmers often hail it as the best place to ply their trade in the UK as it’s secluded location makes for a peaceful day out but yet it also has a eerie and dramatic feel about it. Wales and in particular Snowdonia is well know for it’s slate quarries, in fact we ventured to one only last year to climb which also had a truly epic feel about it. There seems to be something about old slate quarries which creates this feeling of awe and also a little bit of creepiness! Although, we are no strangers either to exploring old, abandoned and frankly scary places (Check out our Urbex exploits: Urban Exploring). There just seems to be something appealing about the idea of a place that was once so filled with activity and energy being left as this ghost like remnant of epic proportions. I do have to also add that climbing the quarried gritstone of the North West of England has to be our favourite surface. Not only because our climbing styles suit it but again because of the strange idea that these people who built these quarries hundred of years ago had no idea they would be also creating some of the most amazing and often legendary climbing routes! Not much is known about the Quarry over looking the tiny mid Wales village of Fairbourne, most of it is local legend and folklore than many “outsiders” never knew existed. The quarry itself was opened in 1867 and slate was carted up a steep path towards the river Mawdach and taken across the bay to Barmouth by boat. In around 1871 the include most made their way up today to visit the blue lagoon was built as an easier and more efficient way to transport the goods from one of the most successful quarries of the area. In 1890 a nearby quarry of Henddol took over the workings until it was eventually abandoned in 1920. Many of the climbable quarries we visit are of a similar age and it really does feel like you are exploring another era of industry. The lake itself is actually another level of the quarry and is reported to be around about 12 metres deep. It was also flooded on purpose after the workings stopped to act a as reservoir for a since abandoned scheme to provide the nearby village of Fairboure with electric. Sitting on the hillside and looking out of the Barmouth bay from below you would be forgiven for thinking this was just a great vantage point from which to view the wonderful coastal are below. Little do many people know the historic and amazing secret it holds! Oh, and the vivid blue colour of the lake really is that bright! It is caused by the dissolved natural minerals from the slate and surrounding rocks and it totally safe and absolutely breathtaking! It also has it’s own population of fish as is the depth of the water and a mysterious WIFI signal from which no one knows the origin! Like many of the Welsh quarries there are still many artefacts laying around, almost as if the workers just left in the middle of the day and never came back. I think it is these left over pieces of history which give these quarries that eerie feeling. Many of these pieces of equipment seem frozen in time, slowly decaying in the spot they came to rest. One of the most striking we have seen was an old track leading right off a sheer cliff, the wooden bridge long since gone and the old cart crumbled 200 ft below! The grit quarries of Lancashire unfortunately don’t often have as many abandoned pieces of equipment but if you look closely on many routes you can see where they drilled and left marks for explosive to be placed into the rock, often some climbs also have little quirky features such as an old drill bits or even spanners left in the wall. Fascinating stuff! As we walked up the steep hillside towards the quarry we found a variety of dressing sheds and foundations of old buildings, all made out the very slate they were quarrying, some still in relatively good states of repair. Crossing through many man made tunnels which the carts would roll over day after day as well as the sealed up tunnel to the original base of the quarry which allowed it to be flooded. Many of the old workings of the pulley system used to transport the carts up and down the mountainside also remain as well as the shed the product would be stored in near to the rail entrance. Seeing remnants such as these really gives you an idea of the scale of the machinery they would use and the dangerous nature of the job the men did up here and often leaves you in awe. After walking past the rusty and barely noticeable sign warning visitors that abseiling was not allowed we continued up to find a spot from which to, erm, abseil! Well, we are the renegades! Our original aim was to of course go from the highest point of the quarry on the enormous overhanging main wall. However after analysing the edge we realised it was just too sharp to stick a rope over. So we ventured a little further down to a ledge just below the top and happened upon some bolts that had been drilled into the wall for this very purpose! This made the rigging so much easier and also safer, but of course we tied to the tree just behind as a backup! Luckily we had some down to Wales with a good friend, Lee, who is a level 3 rope access supervisor so although with our climbing experience we could have set it up ourselves, we left it in his capable hands! So don’t go trying this on your own!! Although we have climbed for years and feeling quite used to being a height, abseiling is always a thrill! Leaning back off the sharp (but now protected) edge is always a test of the nerves but always a great adrenaline rush! There is also something quite nice about hanging off a rope high from the ground without, for once, frantically hanging on to a tiny slither of rock!! It’s a somehow strangely thrilling but relaxing activity for a bunch of climbers! The tranquil setting and view did help though! After getting reacquainted with the different lowering off gear ( the same one which although reported to be the safest shorty nearly killed himself with whilst caving!) we were hanging over the edge ready to go! What I love about doing things like this ourselves is that it’s real, organised “abseils” tend to, in reality, actually be someone just lowering you off from the top, this time we had our fate in our own hands! No extra line, just us and the rope! We took a few turns each and by this time we had drawn a crowd! One of them must have also noticed the…not very noticeable sign… and reported us! So over came an angry Welsh farmer and asked us to promptly leave! Well, we had had our fun and off we went without any trouble! Erm… it’s a secret!! No it’s not actually a proper secret, just not too many people know it’s actually up here. We will include some basic directions and the rest is up to you though!! From Barmouth we took the rather lovely little toll bridge for a cost of around 50p to Fairbourne and made our way up a series of winding paths and tracks. The steep footpath which leads up to the quarry can be found on Ffordd Panteinion where there is also some limited parking. This is near by the a Texico garage and BT telephone box. Head through the “kissing gate” up the steep track staying on track until you reach a slate archway with a slippy stream flowing underneath it. Head up through here and continue to the top, you will soon see the small tunnel leading into the quarry. A great day of adventures and explorations in an amazing setting! Thanks to Lee for taking us and setting up all the gear for us! Have you ever been here or explored any of the other amazing Welsh quarries? 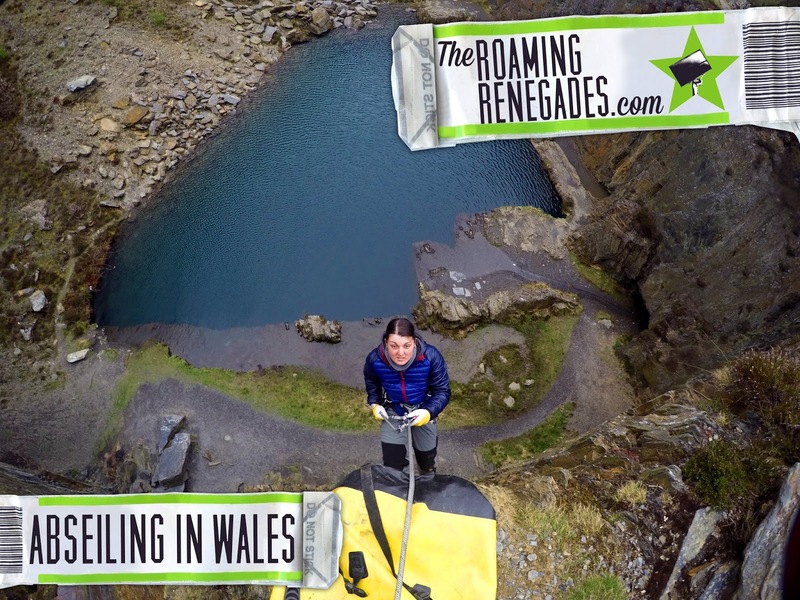 Bookmark this article ABSEILING in an unbelievably picturesque abandoned quarry in WALES. Wow! I am always scared to this kind of things… Great job though and pretty interesting place. Thanks. Yeah I used to be quite scared but the more we have climbed and done other similar things the more fun it has become. But part of us will always be a little nervous but that’s the thrill! I used to get scared when we did things like that but the more you do the more you get used to it! Thanks, couldn’t believe it when it came into view! Awesome that you did this! And you picked a nice spot. I haven’t done abseiling myself, but I’m definitely looking forward to doing it! Cheers, yes an awesome little spot up there. I’m sure you would love it! Wooowww! my stomach flip flopped imagining myself doing such a descent! I’d be up for it for sure I think 🙂 Looks like such a great adrenaline activity! Ah that’s the thrill of it isn’t it, being a bit scared but doing it anyway!! Fun times! OMG I always hate that first step over the edge, relying on the ropes to hold you … abseiling is so much and and this seems like the perfect place to do so! My fear of heights just multiplied haha. The color of the water is indeed gorgeous.